Born in Gujarat, married to Maharashtra, Kanak Rele has chosen Kerala to be her emotional home. So Thrissur, the cultural capital of Kerala, under the aegis of Bharatham, felicitated the artiste. 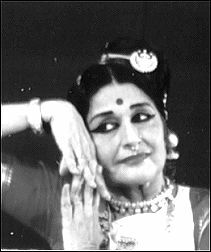 Among the pioneering promoters of Mohiniyattom, Rele's contribution rests on her research on this enchanting dance form of Kerala. She had documented greats like Chinnaammu Amma, Kunjukutty Amma and Kalamandalam Kalyanikutty Amma for her analysis of the kinetics of Mohiniyattom. Kanak Rele thanked the dance lovers of Thrissur. She performed two pieces from her Thejaswani series, Gandhari and Radha. As choreographer and performer she is highly individualistic. In her themes, she explores the strength as well as of the tragic in the Indian situation as it moulds women's lives. Gandhari is the persona of the Indian woman to the core. Eons ago lived Gandhari, trapped in a marriage that made her close her eyes to the deceptions around. Even today live many Gandharis, stony-eyed witnesses to the march of times. So is Radha, the Radha of Vrindavan a symbol of sublimated love when the lover disappears from life. Her conceptualization of Gandhari is remarkable. Gandhari in Kannada raga and adi tala is the poignant story of a woman who gathers spiritual strength from her tormented existence. The lyrics penned by Kavalam Narayana Panikker gives the piece a rare vitality. A young princess comes from far away Gandhar with stars in her eyes to be the Empress of Hasthinapur. She adorns herself anticipating the thrill of the first meeting of her groom. But, her sakhi brings the news that her husband is blind from birth. A stunned Gandhari realizes that she has been cheated. The advances of the blind Dritharashtra is repugnant to her. Yet she must submit, being his wedded wife. Different from the traditional image of Gandhari, here she closes her eyes to the perfidies of the world. She shuts the eyes of her seared soul, shuts the light of worldly joys and envelopes herself in the darkness of her deceived and anguished existence. From her tortured being are born numberless children inheriting the nature of the cruel, loveless union. Even when she understands that her husband is blinded by fascination for the crown, she is silent. The infamous game of chess motivated by her own brother strikes her like lightening. She tells Yudhishtira that ultimately Dharma wins, not individuals. The deaths of her sons in the battlefield, is the test by fire that purifies her soul. Like Phoenix, the mother in her resurrects from the ashes of personal tragedy. Spiritual strength kindles love in her. She becomes a solace to her blind husband while leading him to the forest. Love, in all its selfless purity, dawns when all physical and emotional needs are gone, is the Indian Vision. Radha in ragamalika and talamalika is a different story. The Radha of Vrindavan as seen by the river Kalindhi is the story of a sublimated love. We feel that the river herself is Radha, recalling the thrill of bygone days. The visual translation of the spirit of the wonderful Malayalam poem by Dr. Ayyappa Panikker is the astonishing disclosure of the mundane thing we call love. When Krishna went to Madhura to kill Kamsa and become the king eventually, Radha lost him for ever. She lived in the memories of her lover. Over years, Radha sublimated her love. Stories of women who have sublimated their love to follow their heroes like devotees are numerous in human history. Stories of women who endure rejection with love flowing from their hearts are perhaps untold. Radha is the symbol of those who carry love in the wellsprings of their hearts even in rejection. The episode narrates that Krishna in sleep used to call Radha. This irked Rukmini. The egoistic wife wanted to know Radha, her husband's unforgettable sweetheart. So Krishna brings her to the river-bank where Rukmini sees Radha merged in yogopasana (immersed in her thoughts of Krishna). Radha does not recognize this Krishna in front of her. He is another person, a king and a diplomat. Her Krishna belonged to Vrindavan. Love as an idyll of the pastoral is the burden of human song and Radha its ever-young maiden lost in love. Somewhere we understand that romance is part of the magic of youth, glorious amidst spring in Nature. It cannot survive in the work-a-day human world. Here there are only relationships devoid of love and its enchantment. Credit goes to Kanak Rele for bringing Mohiniyattam out from its frozen discourse: the nayika pining for love. Her heroines have the dignity of spiritual strength. She elaborates abhinaya using mudras. Her training in Kathakali has helped her in this innovative measure that lends dignity. The Thrissurians witnessed a Mohiniyattam different from what they are used to. Changes in costume and hair-do show the stamp of Kanak Rele. Mohiniyattam to the purist is an enchantress swaying in circles and semi circles. The ballet-like presentation is unusual in traditional style. Innovations help an amorphous dance form in its evolution. It is for the future art historians to evaluate Kanak Rele's contribution in the evolution of Mohiniyattom, one of the most charming classical dance forms of the world.